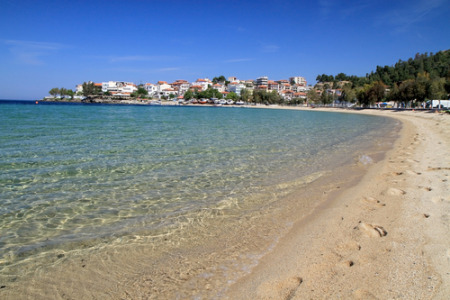 Sani holidays offer a relaxing break on the west coast of Halkidiki's Kassandra peninsula in northern Greece. Lying in an area of scenic beauty with long stretches of sandy beach lapped by brilliant blue waters, holidays in Sani are very popular with families and couples of all ages. This is a purpose built resort and hotel complexes are spread along its seven kilometres of stunning coastline. Holidays to Sani can be taken from April until October with temperatures rising from twenty to thirty degrees in the height of the season. We have a surprising number of cheap Sani holidays waiting to transport you to this haven of tranquility with soft sand between your toes and warm safe waters for bathing. Water sports are provided by the larger hotels and there are a range of recreational facilities. Those who wish to explore the area will find buses to neighbouring towns and excursions to the caves of Petralona with their magnificent rock formations. If you are seeking complete relaxation with a guarantee of summer sunshine, our low cost Sani holidays may be just the ticket. For further information and to find our last minute Sani holiday offers, please use the search facility.